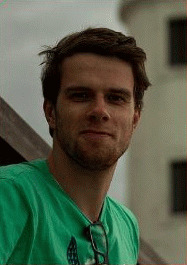 Wojciech Madej left the ORL in February 2016. Click his LinkedIn tag. As my destination for biology studies in 2005 I have chosen one of the most beautiful cities in Poland- Kraków. Already in first years of my education I have realized that cell and medical oriented biology are my major interests and this was the direction I wanted to follow. That is why, on third year of my studies, I started to work in the laboratory of cell biology and imagining, in a group of dr Anna Maria Osyczka. This cooperation resulted in my master thesis in which I have investigated the ability of bioglass composite biomaterials to improve osteogenesis of human mesenchymal stem cells. Additionally during my master’s program I have spent 6 months in Centre for Biomaterials and Tissue Engineering at the University of Sheffield (UK) where I was studying the properties of mechanical loading as regulator of extracellular matrix production in human mesenchymal stem cells. After defending my master’s thesis and obtaining specialization in cell biology, I got the opportunity to further develop my interest in tissue engineering and applied biology in ORL, Nijmegen, The Netherlands, where I have started my Ph.D. project in 2010. Meniscectomy causes dramatic changes in knee joint biomechanics. As a consequence, this surgical intervention generally leads to the development of osteoarthritis (OA). However, the mechanisms how increased loading patterns leads to OA remains largely unknown. In my research I am focused on the role of chondrocytes in this process. Chondrocytes are metabolically active cells and they control the synthesis, assembly and degradation of the cartilage extracellular matrix (ECM) in which they are embedded. They also actively respond to a wide range of mechanical stimuli via changes in gene expression and protein synthesis. It has been shown that in articular chondrocytes, mechanical loading is able to alter the expression levels of various genes involved in many key processes like: matrix turnover, inflammation and also chondrocytes differentiation. During OA development chondrocytes undergo similar alterations like terminal differentiating chondrocytes. Cells become hypertrophic, undergo apoptosis and in a final stage, cartilage is replaced by bone. However, it is known that terminal differentiation can be repressed by action of TGF-beta along with activation of Smad2/3 which are key mediators of this inhibitory effect. 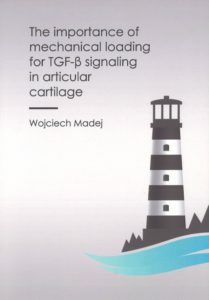 Since during excessive loading after a meniscectomy an OA like process starts in articular cartilage, we wanted to investigate if loading can be a trigger, modulating the TGF-beta signaling pathways and chondrocyte terminal differentiation. To study how excessive loading can influence articular chondrocytes I have developed a ex-vivo laboratory model where full-thickness articular cartilage specimens are compressed with a BOSE ElectroForce® BioDynamic® test system, in culture conditions (see the figure). After stimulation, we can analyze changes in genes expression levels and signalization pathways. It is clear that replacement of damaged parts of a meniscus by an implant might avoid degenerative changes in articular cartilage. During the past years, the Orthopedic Research Laboratory has been focused on designing a biostable meniscus implant with established chondroprotective properties. To achieve all of the objectives and expectations for the implant, several tools and techniques had to be developed and tested to monitor joint homeostasis after implantation. This is where my second part of the project began. After replacement of the meniscus, chondroprotective properties of the implant can be tested by evaluation of interested gene expression levels in articular cartilage. That kind of evaluation can generate a clear picture of articular cartilage conditions, before any macroscopically changes could be seen.